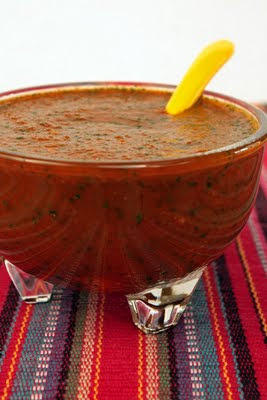 Combine the water and 1 ½ cups of the sugar in a small pot. 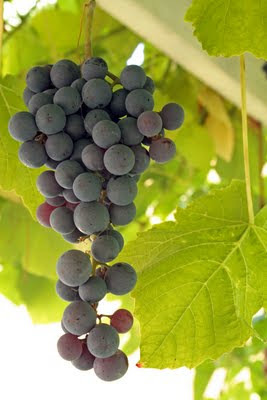 Cut the vanilla bean in half lengthwise, scrape out the seeds, and add both the pod and the seeds to the pot. Heat until the sugar dissolves. Peel, quarter, and core the quinces. Add the quinces to the pot and drape them with a piece of cheesecloth. 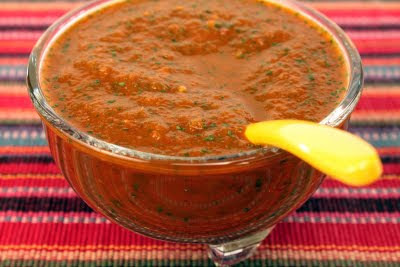 Bring to a boil and simmer for about half an hour, or until tender. Using a slotted spoon, remove the quinces to a paper towel-lined plate, reserving the poaching syrup for another use, and let cool. Preheat the oven to 350ºF. 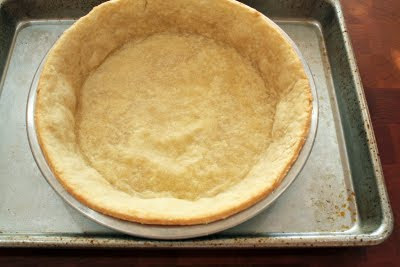 Grease 4 6×3 ¼×2 ¼-inch loaf pans with nonstick pan spray and line the bottom of the pans with parchment paper. Sift together the flour, cinnamon, ginger, cloves, allspice, baking powder, baking soda, and salt. 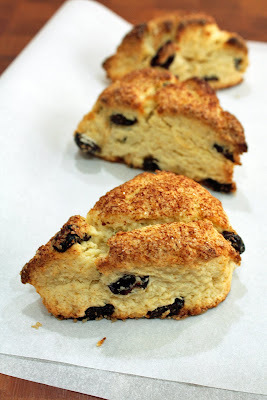 In a mixer fitted with a paddle attachment, beat together the butter, brown sugar, and remaining ¼ cup of sugar on high for 3 to 4 minutes, or until light and fluffy. Beat in the eggs one at a time until thoroughly combined and then beat in the vanilla extract. Add 1/3 of the flour mixture, then ½ of the sour cream, then 1/3 of the flour mixture, then the remaining ½ of the sour cream, and then the remaining 1/3 of the flour mixture, mixing on low for only a few seconds after each addition until just combined, and stopping the mixer once or twice to scrape down the sides of the bowl. Do not overmix. Divide the batter among the loaf pans. 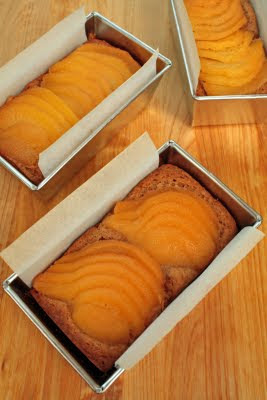 Slice the quinces thinly and fan out the slices atop the batter in each loaf pan. Bake for 45 to 50 minutes, or until the edges of the cakes start to shrink away from the pans and a toothpick inserted into the center of a cake comes out clean. Let the cakes cool in the pans for about 10 minutes. Transfer to cooling racks and finish cooling completely. Makes 4 small loaves, serving 8. 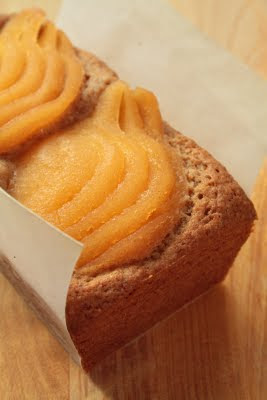 With these aromatic and moist cakes, which were inspired by the first harvest from the small quince tree in our garden, I welcome fall. 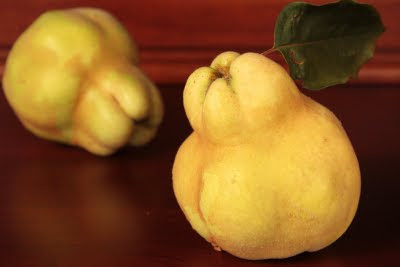 If you don’t happen to have your own quince tree, quinces can be a bit hard to find, but they’re delicious and definitely worth the effort. Look for them at well-stocked gourmet markets. When ripe, quinces are very firm with fuzz-covered golden skin and an intense perfume like that of pineapples and lemons combined. 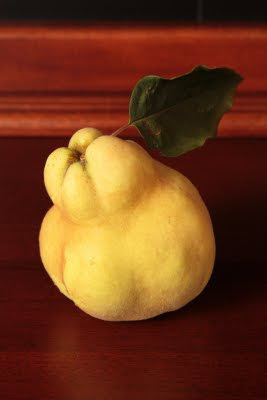 Quinces must be cooked before eating, as they are too astringent to eat raw. 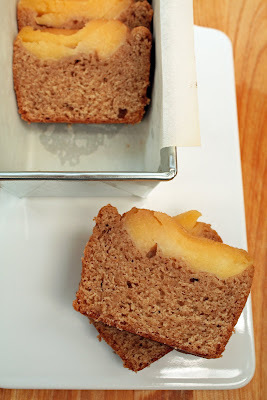 Try these cakes with either apples or pears if quinces are unavailable. 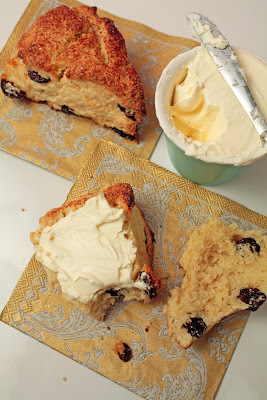 Buttermilk may be substituted for the sour cream, and a 9-inch square cake pan can be used instead of the loaf pans. 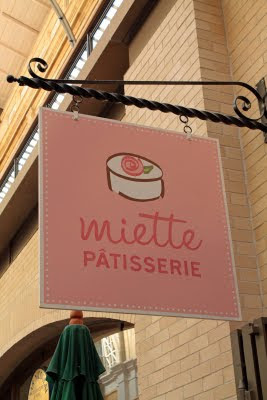 First stop: the Hayes Valley location of Miette with its rainbow of old-fashioned candy. 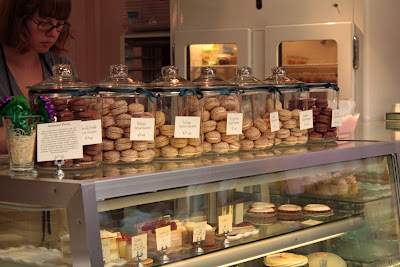 If entering this confiserie doesn’t put a smile on your face, then absolutely nothing will. It is most certainly the place where the saying “like a kid in a candy store” originated. I got a single chocolate macaron. 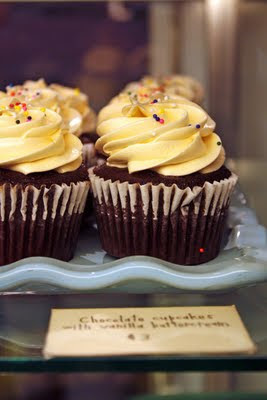 Next destination: the Citizen Cake Patisserie. (Actually, we popped into Paulette and Christopher Elbow on the way, but still mindful of the importance of pacing, I ate only with my eyes. 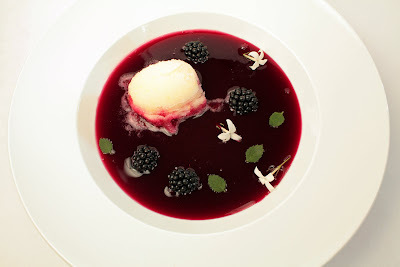 Well, except for a tiny sample of raspberry pâte de fruit, but that doesn’t count does it?) Hubby ordered the After Midnight chocolate mousse cakelette, and I had the Retro Tropical Shag, which was composed of génoise, passion fruit mousse, vanilla buttercream, and coconut. Mine was light as a cloud, and I would’ve happily floated away with it forever. I wish I had ordered a second. Breakfast the next morning, and again the morning after that (yes, it was that good): Tartine with my Twitter pal and fellow food blogger Janice. Hubby and I decided to share. We started with a colossal gougère nearly as big as my head. 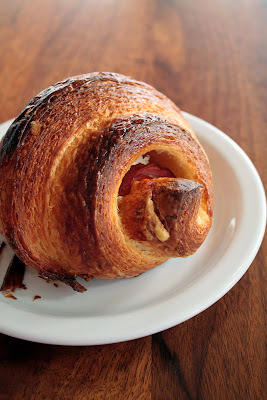 We moved on to an equally humongous ham and cheese croissant. 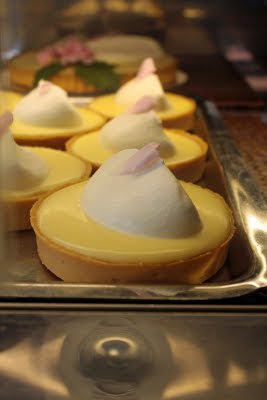 And we took a lemon tartelette to go, just to make sure we didn’t go hungry later. As we were finishing up, they brought out the morning buns. Both Hubby and Janice got back in line for those, and we started all over again. This must’ve been the moment that any pacing went out the window. 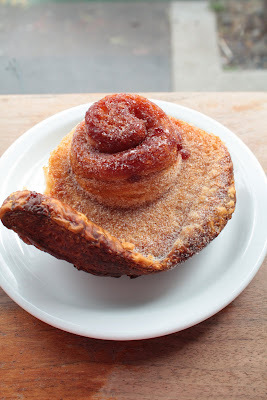 The morning buns, by the way, were flavored with a hint of orange instead of the usual cinnamon. Meeting an internet buddy to share a meal in real life was a thrill! Next stop: the San Francisco Baking Institute, just because I wanted to check it out. They gave us a brief tour and a baguette and several raspberry muffins. I hadn’t planned on eating at this particular stop, but what can I say? I had to have at least one little taste of a muffin, so I took a bite and then accidentally ate the whole thing. The baguette was probably the best I’ve ever had in my life, with a shatteringly crisp crust and complex, creamy crumb. 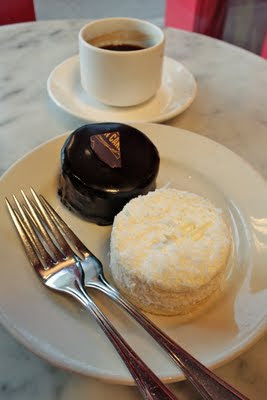 And then: Patisserie Philippe. If only I had been more hungry. 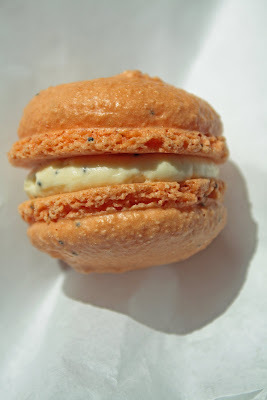 I had one passion fruit macaron. 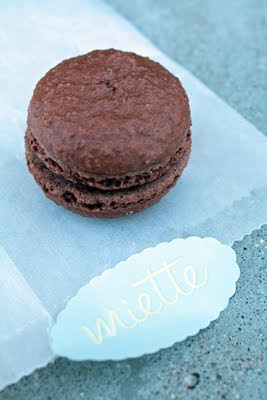 I’m a chocoholic for sure, but—dare I say it—I enjoyed this macaron better than the chocolate one. I suppose it was the heat (it was intensely sunny and hot while we were in San Francisco) that made me crave the tropical fruit flavors. Followed by: dim sum and bubble tea on Clement Street, with shopping at Cookin’ (339 Divisadero Street, 415-861-1854) and Kamei (525-547 Clement Street, 415-666-3699) before and CB2 after. It always amazes me how cheap dim sum is—we had delicious potstickers, shrimp and garlic chive dumplings, pork shu mai, and sticky rice wrapped in lotus leaves all for just $6. But I never did find the green onion pancakes I love so much. Time for dinner: Tanpopo (1740 Buchanan Street, 415-346-7132) in Japantown. Hubby had the very spicy Karamiso Ramen. 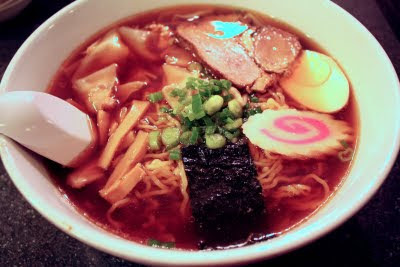 I had the Wonton Ramen, which was served with a soy sauce flavored broth. The only Japanese food we have out is sushi, and believe it or not, I’d only had the instant kind of ramen before. So this was a real treat. I definitely want to learn more about Japanese cuisine now. After our second breakfast at Tartine: cooling refreshment at Tuttimelon. An unplanned stop, but the very long, hot walk to Chinatown got to us. As you may have noticed by now, passion fruit was the recurring theme of my San Francisco trip, and it made its third and final appearance in my cup of frozen yogurt. Hubby had some sort of bubble tea and then decided to help himself to my froyo. We nearly had a scene. These sweet treats sustained us as we braved the Chinatown crowds for more shopping and a stop at Red Blossom Tea Company, where I replenished my oolong supplies. Next up: Caffè Greco in North Beach. It’s the hubby’s favorite spot for chocolate gelato and coffee. I usually have their tiramisu, but this time I abstained. Another long, very hot walk (during which we spotted a flock of San Francisco’s wild parrots!) to the foodie wonderland known as the Ferry Building for some browsing and lunch (at least I think it was lunch, but to be honest, I’d lost track of my meals by that point): carnitas and fish tacos at Mijita as we watched the ferries and sailboats float across the bay. 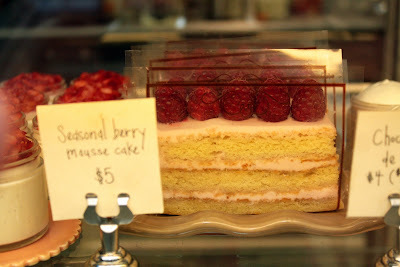 Then a short, air-conditioned walk to the opposite end of the Ferry Building: Miette, take two. And I wasn’t having just one measly macaron this time! I would’ve ordered a chocolate cupcake. But I'd had theirs before and wanted to try something new. 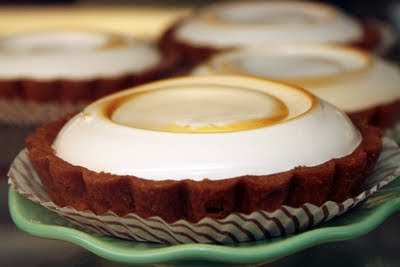 Their lime meringue tartelettes almost looked too pretty to eat. Almost…Though I’m still trying to figure out how they make that perfect swirl in the meringue…Anyway, I settled on the raspberry mousse cake, which was moist, tender, delicate—in a word, dreamy. And our last meal in San Francisco: back to Tanpopo for dinner, since it was right across the street from our hotel, and we were exhausted from hoofing it through the city in the heat. This time we ordered the Ankake Ramen and the Yakisoba. Another tasty, satisfying meal. I really wish I had a noodle joint like this in my own neighborhood. 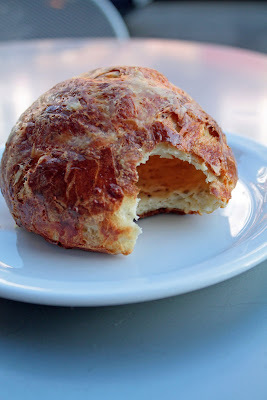 We hit the road bright and early the next morning, and breakfast consisted of some goodies that we had picked up at Acme Bread Company while we were at the Ferry Building. For lunch, we stopped at an In-N-Out Burger—the only fitting way to finish off a fantastic California road trip. 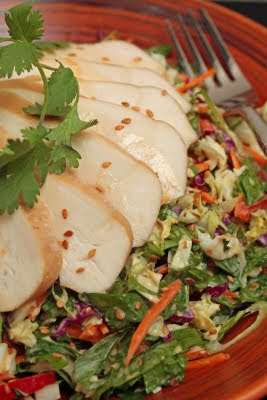 So much good food and so little time…just thinking about it has made me hungry all over again. Little Brother, you asked for it! And you’d better like it! Heat a medium, heavy sauté pan over medium-low heat until hot but not smoking. Add the bacon and fry, tossing frequently, for 9 to 10 minutes, or until rendered. Transfer the bacon to a small bowl. Pour off all but about 2 tablespoons of the fat from the pan and reserve for another use. Add the onion to the pan and sauté for 7 to 8 minutes, or until soft. Transfer to the bowl with the bacon and let cool. Preheat the oven to 400ºF. 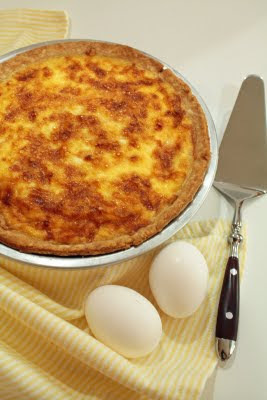 Blend together the eggs and yolk in a small bowl. Stir in the cream and nutmeg and season to taste with salt and white pepper. 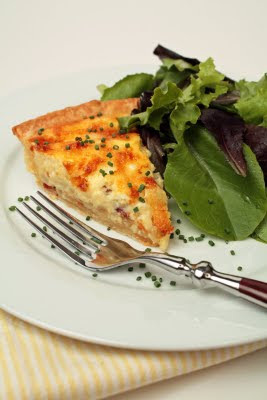 Spread the bacon mixture and Gruyère in the bottom of the tart crust. Slowly pour in the egg mixture. Bake for 28 to 30 minutes, or until puffy and golden brown. 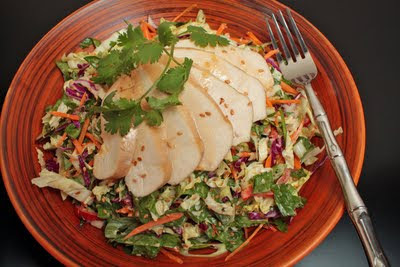 Let cool slightly, cut into portions, and serve. 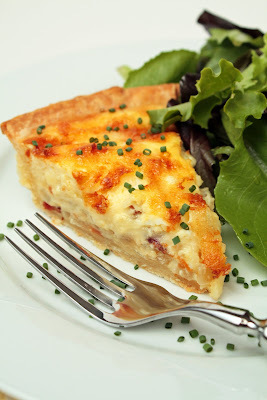 Makes 1 9-inch quiche, serving 6 to 8. Best served warm. There’s a contentious debate going on here about what the best variety of cookie is. The husband doesn’t play favorites (it’s not normal, I know), but he’s quick to say what he dislikes. He doesn’t much care for shortbread, thinks meringue cookies like these are too sweet, and is downright intolerant of chunky cookies, especially if they contain raisins or nuts. I, however, think all cookies are worth appreciating, be they soft and chewy chocolate chip cookies, crisp and crunchy biscotti, cakey and tender madeleines, rich and dense lemon bars, or light and delicate tuiles. While I don’t discriminate against any cookies (OK, I admit I’m with the hubby on the raisin-hate—let’s just say that my grandparents fed me my entire life’s allotment of raisins when I was a kid), I do have a favorite cookie type: sandy and crumbly. Give me a shortbread or spritz cookie, and I’m a happy camper. Even better if it’s dipped in chocolate. Care to join the debate? 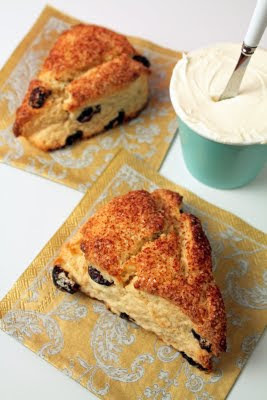 Bring the cream to a bare simmer in a small, heavy saucepan. 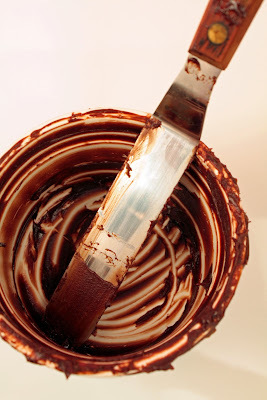 Place the chocolate into a medium bowl, add the hot cream, and whisk until smooth. Let cool to room temperature. Preheat the oven to 375˚F. 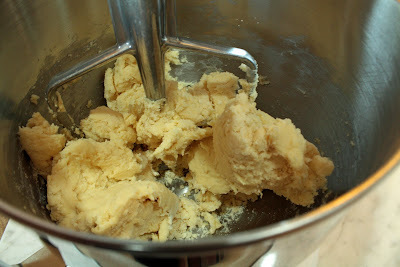 In a mixer fitted with a paddle attachment, beat together the butter, sugar, powdered sugar, and salt on medium until creamy. Add the egg and vanilla and mix on low until blended. 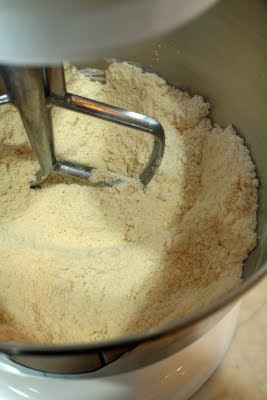 Add the flour and mix on low until the dough comes together, stopping the mixer once or twice to scrape down the sides of the bowl. Transfer the dough to a cookie press and press cookies about an inch apart onto parchment-lined baking trays. 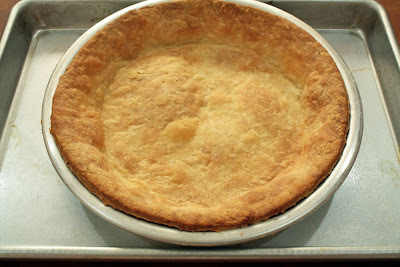 Bake for 17 to 18 minutes, or until lightly browned around the edges. Transfer cookies to a rack and let cool to room temperature. 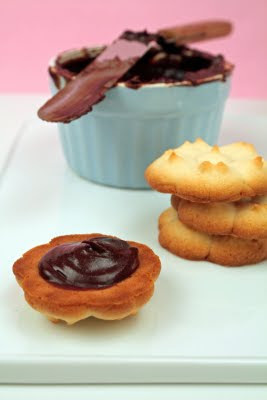 Spread a scant teaspoon of the ganache onto the bottom of one of the cookies and sandwich together with another cookie. 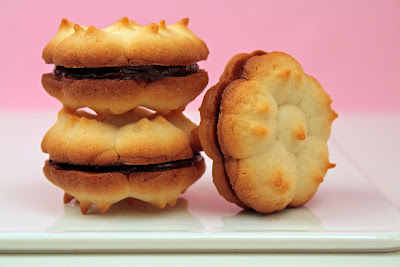 Sandwich together the remaining cookies with the remaining ganache in the same manner. Makes about 20 sandwich cookies. If you don’t have a cookie press, simply use a pastry bag fitted with a large star tip and pipe cookies onto the baking trays in decorative shapes. 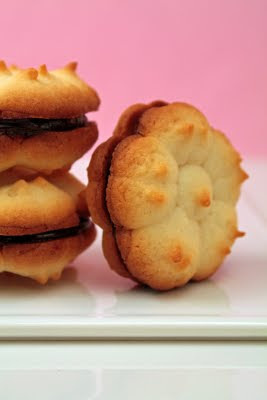 Cookies keep for several days in a tightly sealed container in a cool, dry place.